Well here we are, at the tale end of our schooling years for my first born. Oh how bittersweet these times are! It's so wonderful seeing him grow and flourish and gain more independence, but those times where he would curl up on my lap, or the hours we spent pouring over picture books, or when he would, completely on his own accord, offer you his very last sweet, all seem like they were only yesterday. How I wish I could have those days back, those slow, carefree, full of cuddles days. Any how, this wasn't meant to be an all out sappy post so let's get on with it. We are doing Grade 10 officially this year. Following are the resources we have chosen. In some areas it will appear as though we are doing way too much but I am now looking at these last years as a whole, so many of them will continue to be used into next year and maybe even the following, depending on where he is at. *Life Of Fred - Pre Algebra with Physics, he is continuing to supplement with LOF, keeping a little behind where he is at with MUS so that he can come back around and practice, in a different format, already learned material. *We hope to look at the Physics over at All In One High School, will just see how things are going in that area. *He is still working through the Visits To Europe he began last year. This is really a supplementary course so it doesn't get looked at all that often. *We are currently chatting to an Art teacher about the possibility of doing some Technical Drawing classes with a small group of teens. *Saving for a car eek! Seems like such a huge year when it is all typed up like that, but even with all of this I am still pleasantly surprised with just how relaxed most of our weeks are. He and I have chatted about ramping things up a little for this year, but mostly it's more about ensuring that whatever he chooses to do he gives it his best shot. As is always the case with each year, we are very fluid. We always have a plan but we are always open to plans changing. That looks like an exciting year! 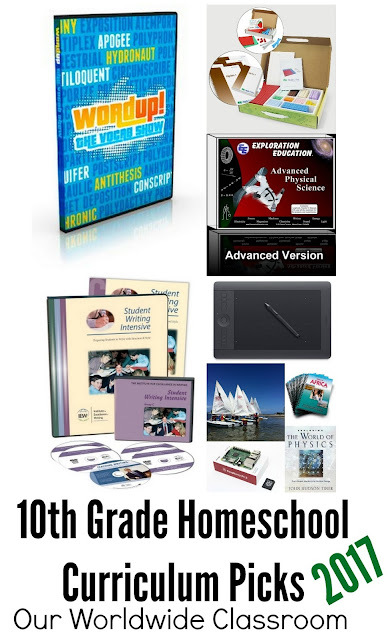 It's a while yet, before we make it so far, but I'm more and more interested in what goes on in the upper years of homeschooling, so I appreciate you taking the time to share. Wow! Looks a bit intimidating to me! Sounds like he has many interests! !